Continuing from where we left off introducing carbohydrates and kicking it off with MONOSACCHARIDES :glucose and fructose, we venture deeper into the realm of Carbohydrates. Monosaccharide sugars are further categorized depending on their structure, in which they display stereoisomerism. 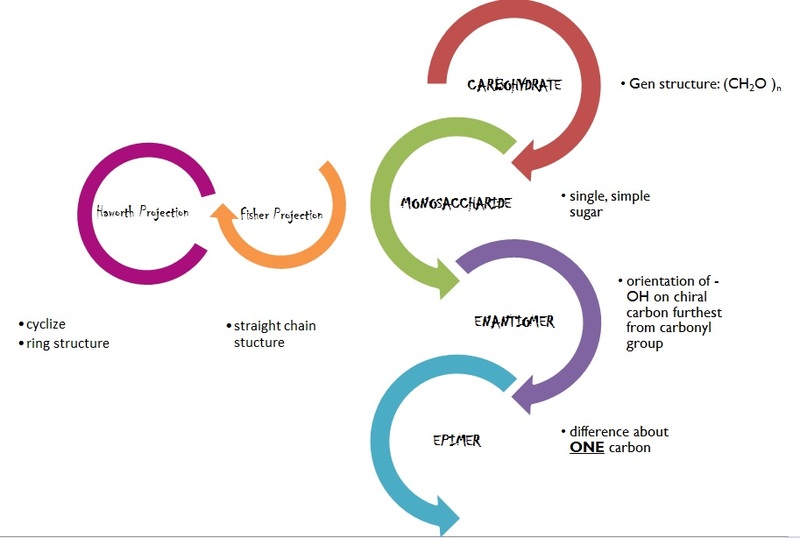 Looking at the structures of glucose and fructose, D&L designation is based on the configuration about the chiral/asymmetric carbon . if more than one chiral center exists, D& L designation refers to the chiral center ( carbon in this case) furthest from carbonyl group. NOTE: in the image on the left, chiral carbons are denoted by * and -OH in question is labelled. groups on the RHS of one molecule is switched to the LHS in the mirror image , and vice versa, not only the hydroxyl ( -OH) which determines D&L designation. Pentose and Ketose sugars can also cyclize from their straight chain to form Haworth projections. 6( or 5) carbon sugar ≠ 6 membered ring structure ; Note fructose and glucose are both hexose sugars but their rings have different a number of sides. Why I majored in Biology: The Pie Chart. Bio + Chem in the right proportions! There are things in life we must all do in order to get "there"....................................for me it's this blog !!! Something amazing is still waiting to be uncovered by the mind capable of understanding it. "you are the result of 3.8 billion years of Evolutionary success. Act like it"